New Moulton Library – Fun, Functional and Fabulous! Marking the start of a chapter for Moulton Library, we left our ‘temporary’ home in the heart of the village - we were there for 47 years - and moved to purpose built premises in the new Community Centre situated alongside a new housing development, in early May this year. The project has been in the planning for years, and started as a vision for a shared space, with library, community café, community rooms for hire and Parish Council offices all under one roof. We’ve always worked closely with the Parish Council in Moulton and have been able to develop the vision for a modern, inclusive library that will benefit the whole community. Following a procurement process, we were delighted to be able to appoint library designers, The Design Concept, to bring our vision to reality. Their design won hands down with the public – it’s bright and airy and as one recent visitor told us - ‘It’s fun, functional and fabulous’! What is the new library like? The space is about three times larger than the old library, but we were clear from the outset that we didn’t want to fill it with three times as much stock. Books and reading may be our bread and butter, but there is so much more to today’s libraries. We were determined to build in flexibility of use so that we can adapt the space to evolving priorities. With public finances as they are, we also had to be clear that we would not be able to fund any additional staffing hours. With this in mind, the library was designed to be easy for customers to use on a self-service basis, with an inviting wide entrance feeding directly into the library from the community café, with a shutter that can be brought down as necessary, rather than a door that would create a barrier. Bespoke units have been designed for our important income-raising retail stock, with extra display space available for hire to local crafters, which can be locked when necessary. Early on in the design phase, we explored alternative ways of extending opening hours without additional staff or additional funding to achieve this! We really wanted the library facilities to be open and inclusive to the whole community, rather than only being accessible to ‘approved’ library customers. We talked to the Parish Council about this and agreed that, when the café franchise was awarded, we would discuss the possibility of the café staff taking oversight of the library at certain times during the day. When we broached the subject with newly appointed café owner, Jeni, she immediately saw the benefits for both of us and readily agreed. So we are now able to be open from 9 – 6 every day of the week, rather than the previous half days only! We did - and continue to - consult with users about the activities etc they would like to see and we work closely with local groups, including the Local History Society, and the WI, as well as the Friends of the Library, to plan joint activities. So far, this is working amazingly well. Customers don’t seem at all concerned when there are no library staff present – they simply walk in and go about their business, although staff reporting for duty do find it a little strange walking in to find the library already busy with customers! The library is designed to be flexible for users of all ages, bright and welcoming for our younger customers, but also creating a dementia friendly environment. 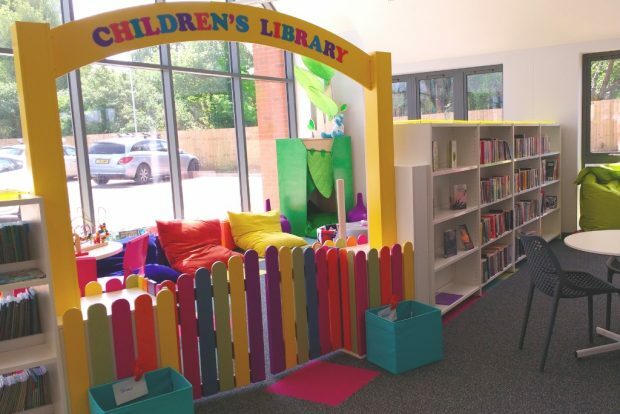 Northamptonshire Libraries are commissioned to deliver the universal elements of the Children’s Centre Services offer, so a whole range of events for the under-fives are on offer – including messy play – so far, the new carpet has survived intact! Our children’s area has proved to be especially popular, complete with cosy reading tree and ceiling lights that change colour – perfect for snuggling up to share a story! A new study area has already proved popular with local students – perfect timing for the summer exam period - and our ‘Study Happy’ guidance leaflets have been snapped up straight away. Giant bean bags provide that all important young adult lounging area for more relaxed moments. No space is wasted and everything has a purpose – so where we needed a barrier to prevent our under-fives customers from escaping, we’ve achieved this with an inviting archway, colourful gate, and a double sided bench that also has charging facilities for laptops and phones! No inch of space is wasted! To give the library a real ‘Moulton flavour’. we asked a local artist if we could use some of his village pictures to provide graphics for some wall art and end panel displays, and the Friends of the Library have funded a glass exhibition cabinet for use by local groups. The WI and Local History Society are already booked to provide changing displays. The whole space has been designed to be flexible for a variety of groups and events, and we are open to new ideas so that we can provide a service that is right for Moulton. Alongside the new library, the Parish Council have funded a ‘Community Connector’ - a lady called Mary-Jane, to promote wellbeing in the community, working particularly with the elderly and the socially isolated. This role links neatly with our wellbeing remit, as Northamptonshire Libraries now sit within the First for Wellbeing CIC. Since the building opened, we’ve already hosted a Wellbeing Day which was attended by 38 organisations and hundreds of visitors, and regular games mornings in the library are underway, backed up by additional book stock – we don’t want any cheating at Scrabble after all! We have many more joint events and activities in the planning pipeline. 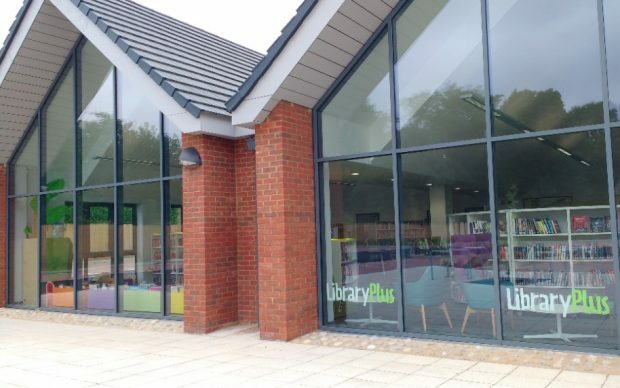 The new library has been very positively received by the local community and we are absolutely delighted to see how much more we can achieve by being in the right location and co-located with the right partners. I think we’ve proved that, as estate agents tell us, only three things matter - location, location, location – and we think we’ve got this right in Moulton! To keep up to date with activities and events in libraries across Northamptonshire, follow them on twitter.